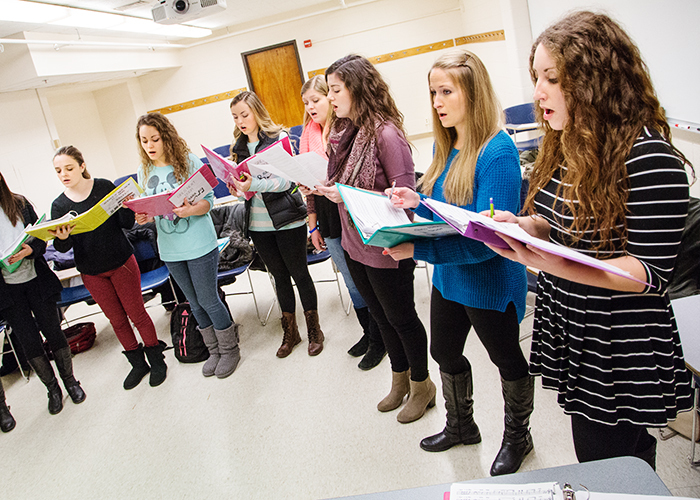 Members of Girls Next Door, the first all-female a cappella group on campus, rehearse the songs in their repertoire. Attend a charity fundraiser on the University of Illinois campus, and you might hear one of the many student a cappella groups singing a classic song such as “Blue Skies.” Or you might hear a group at a student event performing a recent Rihanna hit, or singing a blend of Indian and American pop music at the chancellor’s pre-game party on a football Saturday. The a cappella groups are a way for students who love music to continue to perform at college, as well as relieve the stress of schoolwork. “As a biology major, I spend so much time and energy on my classes and studying, singing is a way for me to take a break from stuff I have to do and do something I love to do,” said Emily Yaniz, a sophomore from Glen Ellyn, Illinois, and a member of Girls Next Door, the first all-female a cappella group on campus. Meghana Srinivasan, a junior in animal sciences from San Jose, California, is a member of Illini Awaaz, a coed South Asian group that combines Hindi and English music. She and Arti Parikh, a junior from Havana, Illinois, who is studying molecular and cellular biology and psychology, said the group is a priority for them, even though it is sometimes hard to balance with schoolwork. “I could be having the worst day ever, but I come to practice and it’s all behind me. I just focus on what’s there,” Parikh said. “It’s just a space where we do music, have fun and work hard,” Srinivasan said. The members of the groups often become close friends, and they also form a larger community of a cappella groups on campus. The groups have musical exchanges, attending each other’s rehearsals and critiquing and learning from each other. Singing with a small group also provides leadership opportunities. The a cappella groups are student-run. The members hold auditions, choose music, organize rehearsals and book their own performances. Asif Bhatti, a junior in bioengineering from Naperville, Illinois, sings with Chai-Town, an all-male South Asian group that performs a fusion of Indian Bollywood and Western pop music. “I’ve seen exponential growth, not only musically but with the business opportunities we’re seeing,” Bhatti said of Chai-Town, adding it’s given him experience in dealing with clients, drafting contracts, managing accounts and producing CDs. Many of the groups arrange their own music. “It’s exciting to see the work come to life,” said Sydney McComas, a senior advertising major from Zionsville, Indiana, and a member of Girls Next Door. Srinivasan has learned a lot about arranging music for a cappella groups and combining two different types of music. Bhatti particularly likes a cappella music because of the emphasis on vocal percussion. “It’s so fun to see this powerful sound made just by voices,” he said.